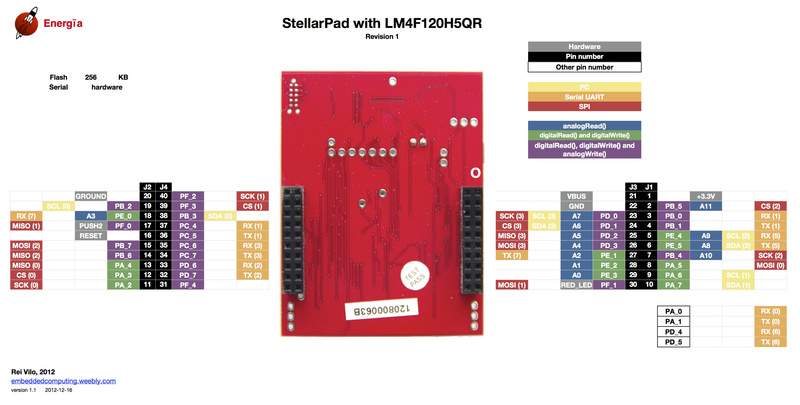 In this article we examine the mbed rapid prototyping platform with the Freescale FRDM-KL25Z ARM® Cortex™-M0+ development board. 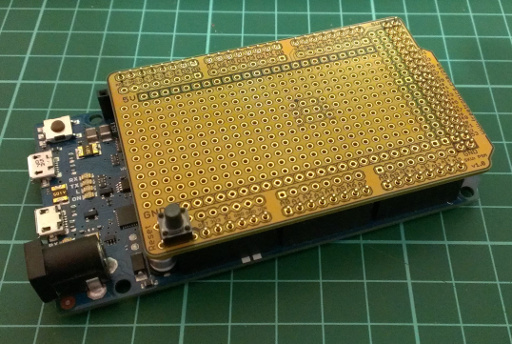 A while ago we looked at the mbed rapid prototyping environment for microcontrollers with the cloud-based IDE and the NXP LPC1768 development board, and to be honest we left it at that as I wasn’t a fan of cloud-based IDEs. Nevertheless, over the last two or so years the mbed platform has grown and developed well – however without too much news on the hardware side of things. Which was a pity as the matching development boards usually retailed for around $50 … and most likely half the reason why mbed didn’t become as popular as other rapid development platforms. 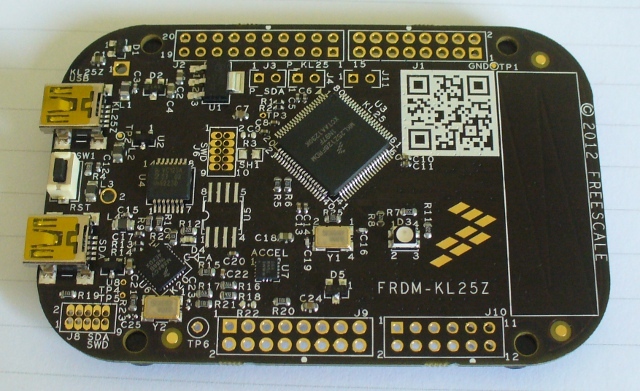 Also – a few months ago – we received the new Freescale Freedom FRDM-KL25Z development board from element14. I started to write about using the board but frankly it did my head in, as at the time the IDE was almost a one gigabyte download and the learning curve too steep for the time I had available. Which was a pity as the board is inexpensive and quite powerful. So the board went into the “miscellaneous dev kit” box graveyard. Until now. Why? You can now use the Freedom board with mbed. It isn’t perfect – yet – but it’s a move in the right direction for both mbed and Freescale. 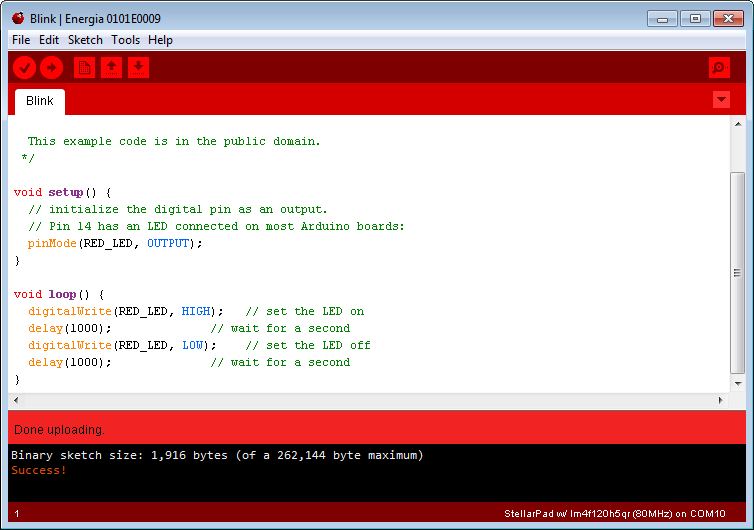 It allows educators and interested persons access to a very user-friendly IDE and dirt-cheap development boards. As you can see the IDE is quite straight-forward. All your projects can be found on the left column, the editor in the main window and compiler and other messages in the bottom window. There’s also an online support forum, an official mbed library and user-submitted library database, help files and so on – so there’s plenty of support. Code is written in C/C++ style and doesn’t present any major hurdles. When it comes time to run the code, the online compiler creates a downloadable binary file which is copied over to the hardware via USB. And what’s a Freedom board? 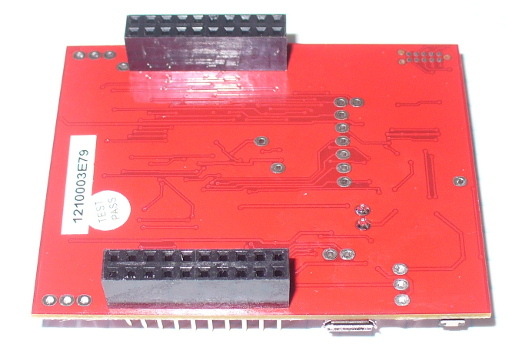 It’s a very inexpensive development board based on the Freescale ARM® Cortex™-M0+ MKL25Z128VLK4 microcontroller. How inexpensive? In Australia it’s $9 plus GST and delivery. In a lot of literature about the board it’s mentioned as being “Arduino compatible”. This is due to the layout of the GPIO pins – so if you have a 3.3 V-compatible Arduino shield you may be able to use it – but note that the I/O pins can only sink or source 3 mA (from what I can tell) – so be careful with the GPIO . However on a positive side the board has the accelerometer and an RGB LED which are handy for various uses. Note that the board ships without any stacking header sockets, but element14 have a starter pack with those and a USB cable for $16.38++. Download and install the USB drivers for Windows or Linux from here. 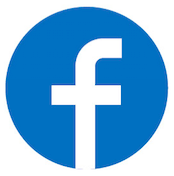 Visit mbed.org and create a user account. Check your email for the confirmation link and follow the instructions within. Now you’re ready to write your code and upload it to the Freedom board. 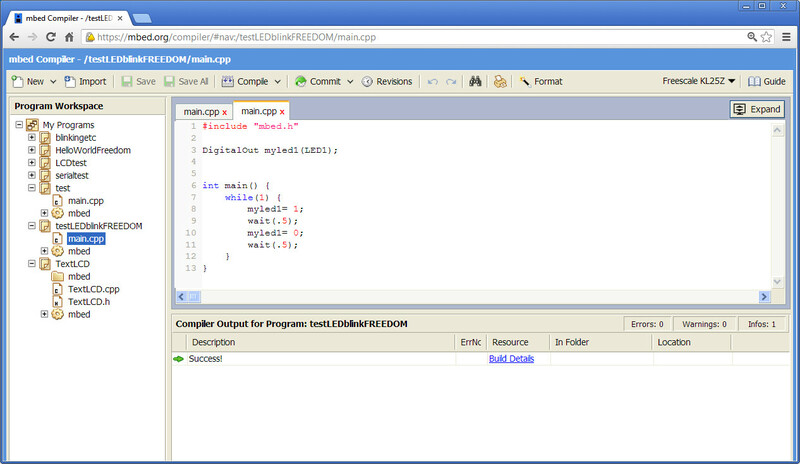 Click “Compiler” at the top-right to enter the IDE. Now to create a simple program to check all is well. When you entered the IDE in the previous step, it should have presented you with the “Guide to mbed Online Compiler”. Have a read, then click “New” at the top left. Give your program a name and click OK. You will then be presented with a basic “hello world” program that blinks the blue LED in the RGB module. Adjust the delays to your liking then click “Compile” in the toolbar. If all is well, your web browser will present you with a .bin file that has been downloaded to the default download directory. (If not, see the error messages in the area below the editor pane). Now copy this .bin file to the mbed drive, then press the reset button (between the USB sockets) on the Freedom board. Your blue LED should now be blinking. Just add “PT” to the pin number. Note that the LEDs are connected to existing GPIO pins: green – PTB19, red – PTB18 and blue – PTB. It’s up to you. Review the Freedom board manual (from here) and the documentation on the mbed website, create new things and possibly share them with others via the mbed environment. For more technical details review the MCU data sheet. 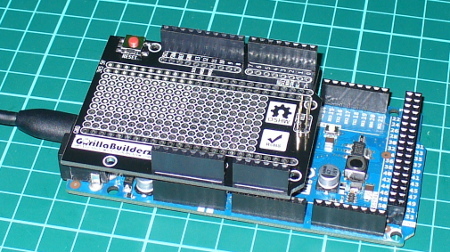 The Freedom board offers a very low cost way to get into microcontrollers and programming. You don’t have to worry about IDE or firmware revisions, installing software on locked-down computers, or losing files. You could teach a classroom full of children embedded programming for around $20 a head (a board and some basic components). Hopefully this short tutorial was of interest. We haven’t explored every minute detail – but you now have the basic understanding to move forward with your own explorations. 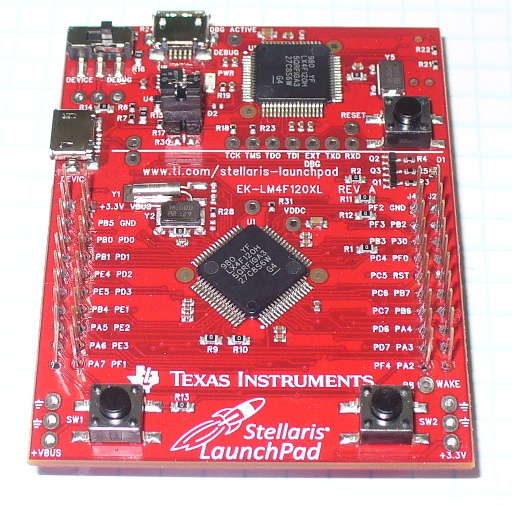 The Freescale Freedom FRDM-KL25Z development board used in this article was a promotional consideration supplied by element14. 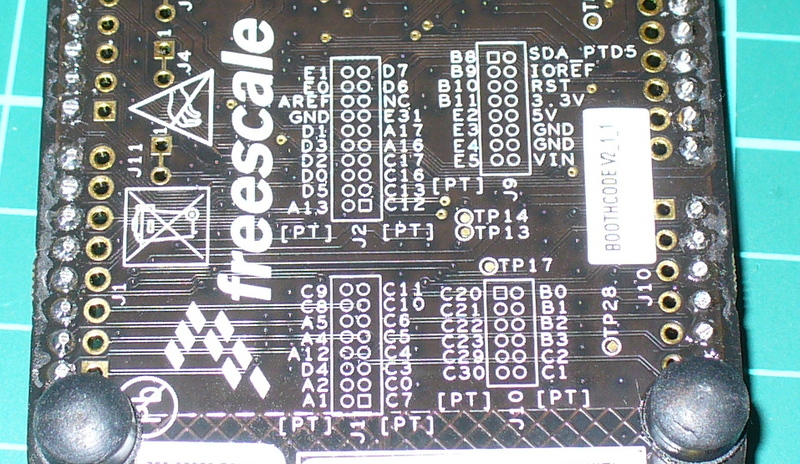 The post mbed and the Freescale FRDM-KL25Z development board appeared first on tronixstuff. 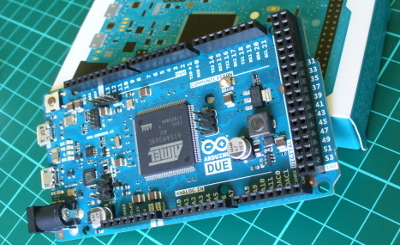 After much waiting the Arduino Due has been released, so let’s check it out. We’ll run through the specifications and some areas of interest, see what’s different, some random notes – then try out some of the new features. Before moving forward note that it might look the same - the Due is not a drop-in replacement for older boards – even the Mega2560. It’s different. Arduino Due is ideal for those who want to build projects that require high computing power such as the remotely-controlled drones that, in order to fly, need to process a lot of sensor data per second. Arduino Due gives students the opportunity to learn the inner workings of the ARM processor in a cheaper and much simpler way than before. Sounds good – and the Due has been a long time coming, so let’s hope it is worth the wait. The SAM3X CPU holds a lot of promise for more complex projects that weren’t possible with previous ATmega CPUs, so this can be only a good thing. Right away a few things should stand out – the first being the operating voltage – 3.3V. That means all your I/O needs to work with 3.3V – not 5V. 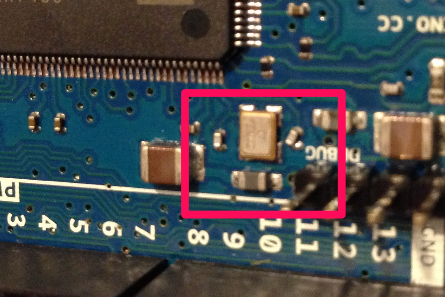 Don’t feed 5V logic line into a digital input pin and hope it will work – you’ll damage the board. Instead, get yourself some logic level converters. However there is an IOREF pin like other Arduino boards which intelligent shields can read to determine the board voltage. The total output current for all I/O lines is also 130 mA … so no more sourcing 20mA from a digital ouput for those bright LEDs. The power regulator for 5V has been changed from linear to switching – so no more directly inserting 5V into the 5V pin. However the 3.3V is through an LDO from 5v. Each digital I/O pin can source 3 or 15 mA – or sink 6 or 9 mA … depending on the pin. High-current pins are CAN-TX, digital 1, 3~12, 23~51, and SDA1. The rest are low current. And there’s still an LED on digital 13. You will need to redesign any existing projects or shields if moving to the Due. The analogue inputs now have a greater resolution – 12-bits. That means it can return a value of 0~4095 representing 0~3.3V DC. To activate this higher resolution you need to use the function analogReadResolution(12). Excellent. A new feature is the onboard erase button. Press it for three seconds and it wipes out the sketch. The traditional serial line is still digital 0/1 – which connect to the USB controller chip. Hardware serial – there’s four serial lines. 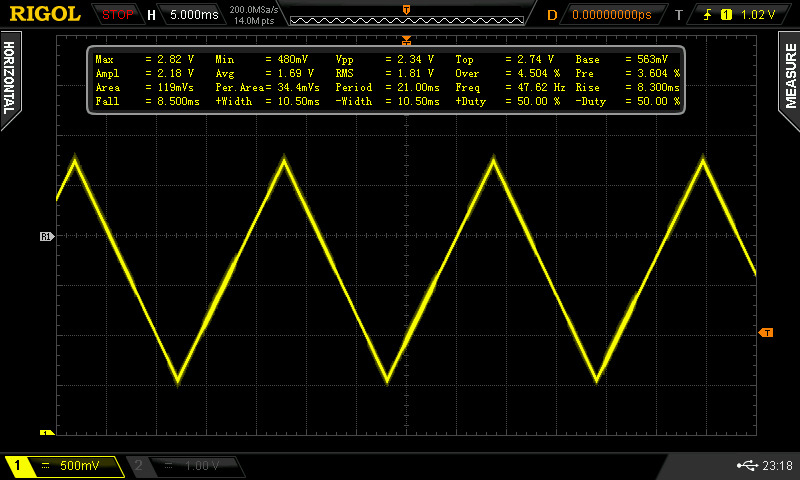 Pulse-width modulation (PWM) is still 8-bit and on digital pins 2~13. You can also use the extended SPI function of the SAM3X which allow the use of digital pins 4, 10 or 52 for CS (chip select). The SAM3X supports the automtive CAN bus, and the pins have been brought out onto the stacked header connectors – however this isn’t supported yet in the IDE. There are two I2C buses – located on digital 20/21 and the second is next to AREF just like on the Leonardo. There’s a 10-pin JTAG mini-header on the Due, debug pins and a second ICSP for the ATmega16U2 which takes care of USB. Speaking of USB – there’s two microUSB sockets. One is for regular programming via the Arduino IDE and the USB interface, the other is a direct native USB programming port direct to the SAM3X. The SAM3X natively supports Ethernet, but this hasn’t been implemented on the hardware side for the Due. However some people in the Arduino forum might have a way around that. First of all – at the time of writing – you need to install Arduino IDE v1.5.1 release 2 – a beta version. 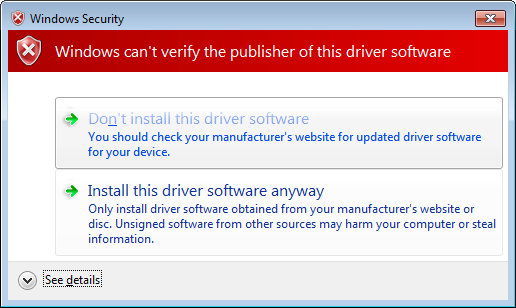 Windows users – don’t forget the USB drivers. As always, backup your existing installation and sketch files somewhere safe – and you can run more than one IDE on the same machine. When it comes time to upload your sketches, plug the USB cable into the lower socket on the Due – and select Arduino Due (Programming Port) from the Tools>Board menu in the IDE. This opens up all sorts of audio possibilities. With appropriate wavetable data saved in memory you could create various effects. However the DAC doesn’t give a full 0~3.3V output – instead it’s 1/6 to 5/6 of the Aref voltage. With the IDE there are example sketches that can play a .wav file from an SDcard – however I’d still be more inclined to use an external shield for that. Nevertheless for more information, have a look at the Audio library. 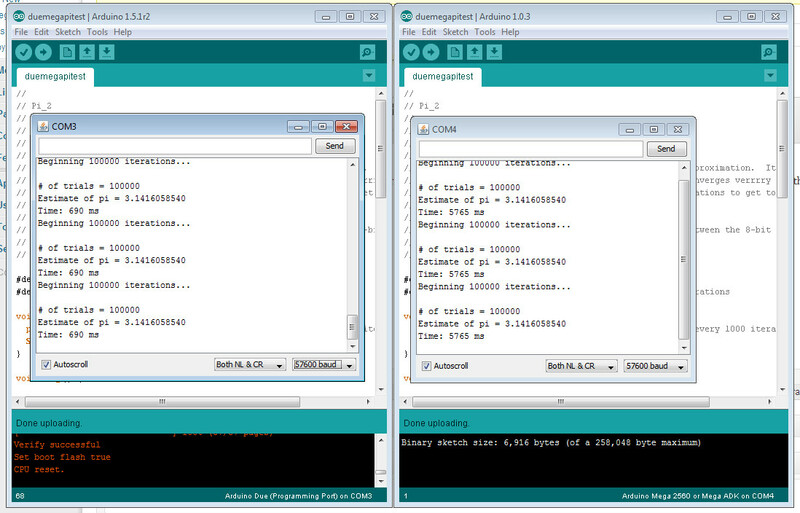 Furthermore, take heed of the user experiences noted in the Arduino forum – it’s very easy to destroy your DAC outputs. 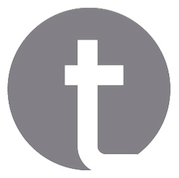 In the future we look forward to experimenting further with the Due – so stay tuned. Good luck … at the time of writing – the Dues seem to be very thin on the ground. 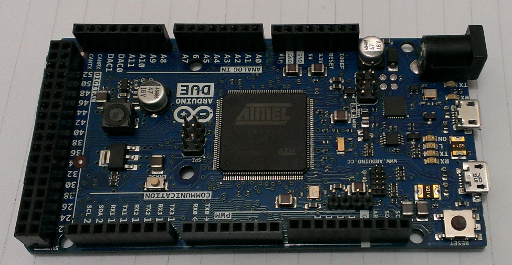 This may partly be due to the limited availability of the Atmel SAM3X8E. My contacts in various suppliers say volumes are quite limited. One side of the crystal capacitor wasn’t in contact with the PCB. However this was a simple fix. How the QC people missed this … I don’t know. However I’ve seen a few Arduinos of various types, and this error is not indicative of the general quality of Arduino products. 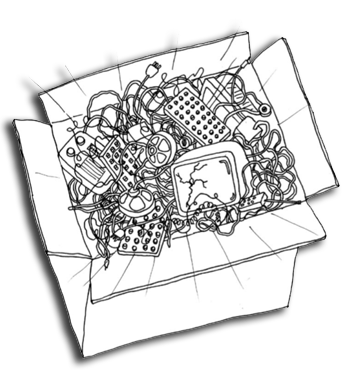 Visit the official Arduino Due page, the Due discussion section of the Arduino forum, and check out the reference guide for changes to functions that are affected by the different hardware. Well that’s my first take on the Due – powerful and different. You will need to redesign existing projects, or build new projects around it. And a lot of stuff on the software side is still in beta. So review the Due forum before making any decisions. 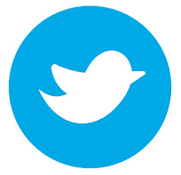 With that in mind – from a hardware perspective – it’s a great step-up from the Mega2560. So if you’re interested – get one and take it for a spin, it won’t disappoint. The software will mature over time which will make life easier as well. If you have any questions (apart from Arduino vs. Raspberry Pi) leave a comment and we’ll look into it. 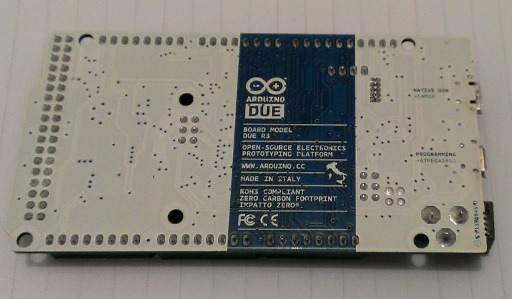 The post First look: Arduino Due appeared first on tronixstuff.